Like many others, I’ve simply gotten used to my food allergies. Oh, there are a few items that I miss, but as more and more time elapses, those one time treats have become more of a distant memory than a current craving. However, there are two exceptions: garlic and pumpkin pie (but not together). I remember the day when I received the results from my food allergy testing. When I saw the word “garlic” on the list, I paused and looked up at my doctor, my eyes questioning whether this was some kind of cruel and evil joke. Garlic? I am Italian. My grandparents were from Italy. We bleed garlic. I cook with it every single day. It’s been several years since I last cooked with garlic, but last week I was working on a recipe idea for a contest that required garlic. As I sauteed the garlic I lingered by the stove a little longer, stirring and savoring the wafting scent of sauteed garlic. Oh, how I miss garlic! There’s just no garlic substitute out there. The other item that I truly miss is pumpkin pie. While I am not allergic to pumpkin, eggs are not my friend. With most traditional pie recipes calling for two to three eggs, I was left to experiment with applesauce, flax meal, and a host of other crazy substitutes. None of them were quite right. But I persevered. There was one Thanksgiving that I attempted to make a pumpkin pie without eggs. That, my friends, was an epic fail, so much so that I never tried again. Each Thanksgiving and Christmas I stare longingly at the pumpkin pie and secretly wish for a slice or a mere morsel. Well, this year I vowed to put aside that stare and work to create a pumpkin-pie-like dessert that would satisfy my craving. What I came up with is hybrid of some of my favorite things: pumpkin, streusel, and cheesecake filling. I started by making a gluten free snicker doodle cookie dough. The dough would serve as the base to my pie, as well as the crumb topping. A generous amount of cinnamon is added to the dough leaving behind a simply heavenly aroma. The pumpkin itself is not too sweet and is filled with all of the traditional pumpkin pie spices that you would expect in a pie. I omitted the eggs and replaced them with cream, powdered sugar, and a bit of flour to hold it all together. The result was utterly delicious and reminded me of pumpkin pie with every single bite. Success! Craving satisfied. Longing stares shall be no more. Mission accomplished. Begin by creating the cookie crust and crumbs. Place the powdered sugar (be sure to sift to work out lumps), flour, and cinnamon into a large bowl. Place the cubed butter into the bowl. Using either a pastry cutter or your hands (which I prefer), work the butter into the dry ingredients. This will take a few minutes and require a bit of muscle, so roll up your sleeves and go for it! You know you are finished when the dough holds together into large crumbs. Reserve 2 cups of the cookie dough for later. Press the remaining dough into the bottom of an 8″ x 10″ baking dish. You may also use a 10″ round, spring form pan. Using a fork, pierce the dough several times. Bake for 15 minutes. Meanwhile, create the filling. Cream the cream cheese until smooth. Add in the condensed sweetened milk and pumpkin puree, continuing to mix until smooth and well incorporated. Add in the cream and mix well. Sift together the remaining dry ingredients. Now, this is important: very gradually sprinkle the dry ingredients into the wet. Doing this step too quickly or simply dumping all of the dry ingredients in will result in lumps in your pie filling. No good! So, take your time. I promise that it will be worth it. Remove the cookie crust from the oven. Pour the pumpkin filling over the crust. It is best to slowly add the filling, drizzling it all over the crust. If you simply pour the filling into the center of the crust, you will create a crater. Again, no good. Gently spread the filling to the edges of the pan. Using the reserved cookie dough, create crumbs and sprinkle them on top of the pie filling. Place the pan on top of a wire rack and allow to cool for at least one hour before serving. Once cooled use a handheld sifter to sprinkle powdered sugar on top. Another option for this dessert is to refrigerate and completely chill the pie before serving. This allows the pumpkin filling to completely cool and set resulting in a pumpkin cheesecake-like filling. My family loves this dessert chilled completely. I recommend taking this extra step. A sweet distraction to a busy week! Thanks! Thanks for popping over, Stephanie. I hope that you love the snickerdoodle bars as much as we do. I agree about the allergy testing. Taking out garlic, as painful as it was for me, did take away the rashes I was getting. But I miss it so! My list of allergies/intolerances is long, and while I try my best to eliminate, I can’t do it all. I do exactly what you suggest. I have learned which items make me react (rash, tight chest, breathing) and stay clear of those. Eggs are a big no no for me. My biggest issue right now is trying to tackle inflammation that simply will not go away. You’re a good momma tackling these food issues with your kiddos. Thank you so much! 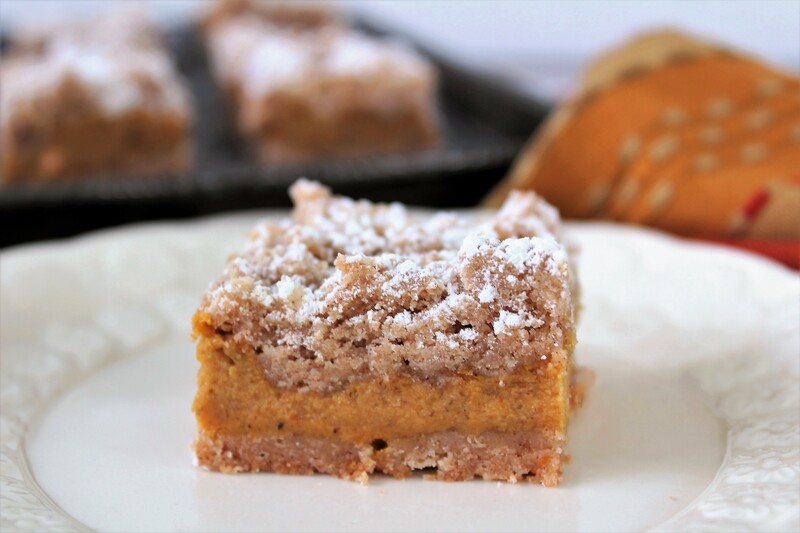 It’s one of our favorite pumpkin recipes. Glad you popped over! This looks so good! We have egg/peanut and tree nut allergies. I was wondering if you thought it would be ok to use regular flour for this recipe? We don’t have to be gluten free. Yes, I believe that you could use equal amounts of wheat as a sub. Hello Kim thank you from NM for your wonderful recepies.. was wondering if you could double this and use a 13X9? Thanks for your kind words, Jamie! I have not tested the recipe in the larger pan and haven’t tried doubling it. But, I think that you would be fine to double the recipe and increase the pan size. I do believe that the filling portion of the bars will be thicker, though, and could potentially require a longer baking time. Just be mindful of the center and that it is set. Pop a cake tester or butter knife in the center to see if it comes clean. Let me know if you give it a try!